damned freaks in the alley…, a photo by IntangibleArts on Flickr. “That’s a tautology!” the enormous biker he’d landed on said. The biker weighed about 300 pounds and had the most impressive mullet that Tigger had ever seen. It was magnificent! The other bikers in the bar agreed, nodding their heads. 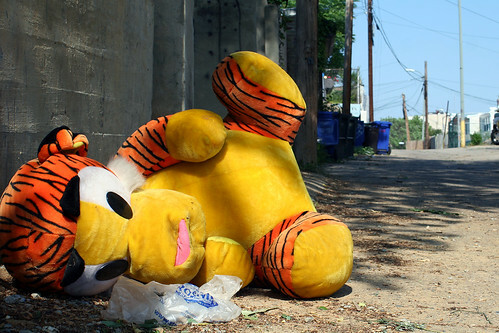 “If you’d said, Tiggers are wonderful because we’re bouncy, that would have been fine,” the guy behind the bar said. He was wearing a leather vest and had nearly as much hair on him as Tigger, though it wasn’t a wonderful orange color. “I don’t know who the Sherman Brothers are, but they have very poor logic skills,” said the giant biker Tigger was sitting on. He reached under the bar and produced a baseball bat. Alltop is great, because it’s just so fabulous! Originally published January 2011, and now also in Pirate Therapy and Other Cures. This post is a wonderful thing, because it is so wonderful.